Uppersia Iran Travel blog: Ali Sadr cave, the biggest water cave in the world! Ali Sadr cave, the biggest water cave in the world! Ali Sadr is the biggest water cave of the world, created during Jurassic era, about 190 million years ago! This cave is located in Hamedan province in west of Iran and it is about 2100 meters high above the sea level. 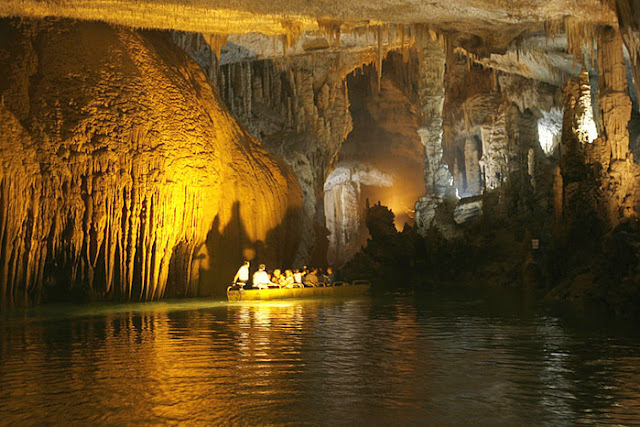 Ali Sadr cave includes rambling corridors and a vast lake and going through the cave and exploring it is only possible by riding the boats, available there. The water in the lake of Ali Sadr cave is tasteless, odorless and colorless and no animal life has been recognized in this water. This water, which is about 14 meters deep at its deepest spot, has a stable temperature about 12°C, during four season of the year and it is so clear and bright. The thousands of stalactites and stalagmites in Ali Sadr cave are in different colors and very beautiful shapes. 11 kilometers of this cave have been mapped so far but the rest is is still undiscovered and 3 kilometers of it is safe for the visitors. Riding in a boat, moving through this vast lake and exploring the deepest parts of this stunning natural wonder is going to be a nice experience which is not available everywhere.